In a blog post on March 8 I asked my readers for suggestions of people to interview at Rootstech I only got one specific suggestion from Jenny who said "You should interview Audrey Collins - since you know her you will be able to relax and should be able to get a good interview!" Not wanting to disappoint I emailed my mate Audrey asking for an interview and, as I knew she would, Audrey agreed. 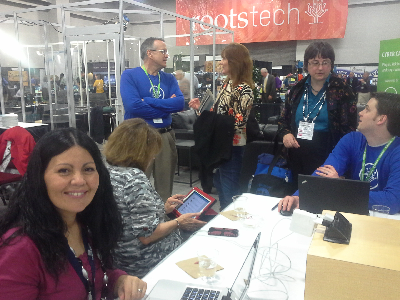 We got together on the second day of Rootstech to have our on-air chat. Those Australians who went to Audrey's talks on her 2012 Australian tour will be interested to hear how Audrey became involved in genealogy and landed her "Dream job" at The National Archives in Kew. I have been uploading my Rootstech videos and scheduling blog posts relating to them to appear every few days so some savvy people have already found the following video on Youtube, viewed it and mentioned it on social media. Those who haven't yet seen it and those who don't know Audrey you may wish to watch the following clip and meet my mate Audrey. When I was offered a chance at Rootstech to interview Dennis Brimhall, Familysearch CEO, I had mixed emotions. I was thrilled to be offered this opportunity but nervous about interviewing such an important man in the world of genealogy. I had an hour or so to get ready for the interview so I pestered my fellow Official Bloggers asking them what they thought I should ask Dennis. For most of the interviews I conducted at Rootstech I just chatted with my interviewees but this one was serious stuff so I prepared questions and saved them in Evernote on my tablet. During the interview I clutched the tablet, referred to my questions and prayed that I sounded coherent. One of the things I asked Mr Brimhall was how we, the users of Familysearch resources, can assist the organisation. Please take a look at the video to see what he has to say. Thank you to Paul Nauta and Rob Goates, the Rootstech PR people, for offering me the chance to interview Mr Brimhall and to Mr Brimhall for taking time out of his busy schedule to chat with me. One of the Australian contingent at Rootstech was young Australian geneablogger, Alona Tester, author of the Lonetester blog. In this interview Alona told me how she came to blogging and about the three blogs she writes. I had a fun time interviewing Alona, one of the fresh young faces of geneablogging. A few years ago I decided to host my own family website, http://www.geniaus.net. After casting around for a while I settled on TNG (The Next Generation of Genealogy Sitebuilding) developed by Darrin Lythgoe from Utah. I have been delighted with the program and the support provided by Darrin and a dedicated band of users. Darrin told me last week at Rootstech that there are now 14,000 users of his program. I was pleased to read this tonight on The TNG Facebook Page "Looks like it's official: TNG has won the 2013 Genealogy Readers' Choice Award for "Best Tool for Putting Your Family Tree Online"! Thanks everyone!" Family Historian, the software program I use for maintaining my database on my computer, came in a close second to Roots Magic. I was pleased to meet and interview Simon Orde, the developer of Family Historian, at Rootstech. As soon as I get a hotel with a good internet connection I will post that interview on this blog. Congratulations to both Darrin and Simon on your well-deserved accolades. A full list of winners can be seen on the About.com site. 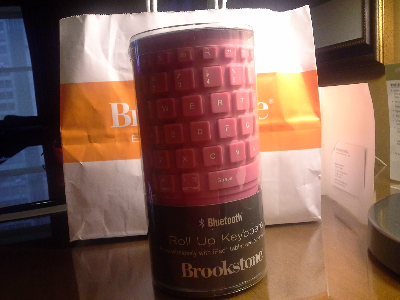 Wandering through The Airport In Salt Lake City I Spied This Bluetooth Keyboard In My Favourite Colour, Pink. I Just Had To Add It To My Cache Of Gadgets. In his address to the Official Bloggers at their pre Rootstech dinner Familysearch CEO, Dennis Brimhall, emphasised the need to get young people interested and involved in family history. To that end the Rootstech organisers nominated Day 3 of Rootstech as a youth day. Nearly 2,000 young people aged between 12 and 18 registered to come along to the conference on Saturday. My mate DearMyrtle was so proud to have some of her grandchildren visit, I saw a mob of youngsters in Scout uniforms wandering around and observed Paul Nauta nattering with a group of teens in the media hub. The average age of Rootstech attendees plummeted on Saturday. I had met a young man, Eli, earlier in the week and was pleased to see that he had come along for the Saturday activities. I asked Eli and his Dad if I could conduct a video interview with Eli and I was thrilled to be able to have a quick chat with hin. You will be as impressed as I was with this confident and eloquent 13 year old genealogist. Please take a look at my interview with Eli. Thank goodness that I didn't ignore my alarm yesterday morning. I dragged myself out of bed, conducted my ablutions, had a quick brekkie with a group of genealogists from rural Alberta, Canada and moseyed through the snow to the entrance of the Salt Palace, site of Rootstech 2013. Arriving early I was able to get an aisle seat with a great view towards the back of the main hall. While I waited for the keynote presentation from David Pogue I fired up my tablet and checked my social media accounts. Shipley Munson, Director of Marketing for Familysearch, introduced David, the first keynote speaker for the morning. I was looking forward to hearing David because I have followed his blog and tweets for a couple of years. What I didn't know was that David was a talented, engaging and humorous presenter who has many strings to his bow. David's talk was amusing, inspiring and instructive; during the course of his presentation complimentary tweets were flying around the twitterverse. As a finale to his presentation David sat at the grand piano and performed a couple of parodies on the Steinway; the audience was agog. It was such a masterful performance that the audience rose to give David a standing ovation. I was on a high when I returned to the media hub to drop off my gear and prepare for a day of networking and classes. I was discussing my video times with a Rootstech organiser when he said "Jill, you've got 15 minutes with David Pogue". PANIC STATIONS - I wasn't prepared for an interview, I hadn't done any homework on the subject but I wasn't going to miss out on the opportunity so I introduced myself, ushered David into the video studio and set sail. Thanks to David for being such a charming and gracious interviewee. You can view the interview below. 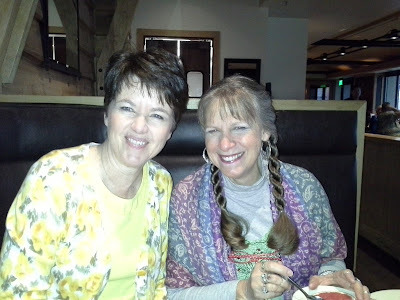 I was thrilled to have company from home at Rootstech this year. Mr Geniaus and I finished our time at Rootstech tonight with a quiet dinner with Margaret and Geoff Doherty from Queensland . Margaret is the President of the Genealogical Society of Queensland while Geoff has an interest in social history and interesting stories of quirky forbears. 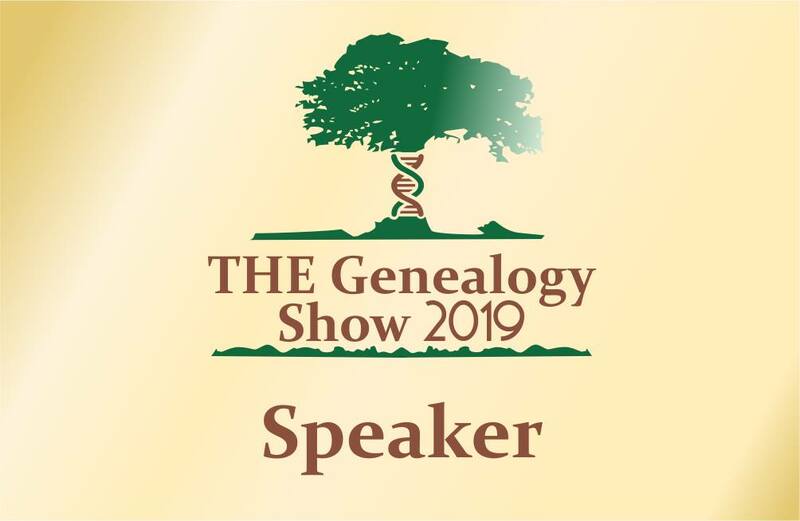 Next stop for the Dohertys is Victoria on Vancouver Island in Canada where Geoff will present a talk at the local Genealogy Society. I was fortunate in being able to conduct a video interview with Margaret while at Rootstech that I will post to this blog in the coming days. Of the dozen or so interviews I conducted at Rootstech I will tonight share below one recorded with Alan Phillips and Alona Tester from Unlock the Past in which they talk about their companies, why they travelled to Rootstech and about the exciting program of geneacruising they have planned for the next three years. One of my co-panelists in "The Genealogist's Gadget Bag International Panel" was Heather Rojo from New Hampshire. When an opportunity to use the interview room arose I talked Heaather into granting mean interview and I am so glad that I did because she was a bright, bubbly and iinteresting interview subject. Yesterday morning at Rootstech it was my privilege to interview Else Churchill, Genealogist, from The Society of Genealogists and Alec Tritton, Chairman of The Halsted Trust. This was the first of a number of interviews I have conducted at the conference. I thank Else and Alec for handling a novice interviewer with kid gloves. My experience at Rootstech this year is so different from that of previous years. I feel that I am just hitting my straps as an Official Blogger and, as a consequence, I am spending more time meeting, talking to and interviewing people. I think I will surpass the goal I have set of meeting 67 (1/100th) of the attendees here this year. I think I have conducted more video interviews than any other Official Blogger except perhaps for DearMyrtle (Pat Richley-Ericson). I feel that I have learnt as much from interviewing a diverse range of Aussies, Brits and Americans as I would have in attending formal sessions. Interviewing Familysearch CEO, Dennis Brimhall was a high spot today. 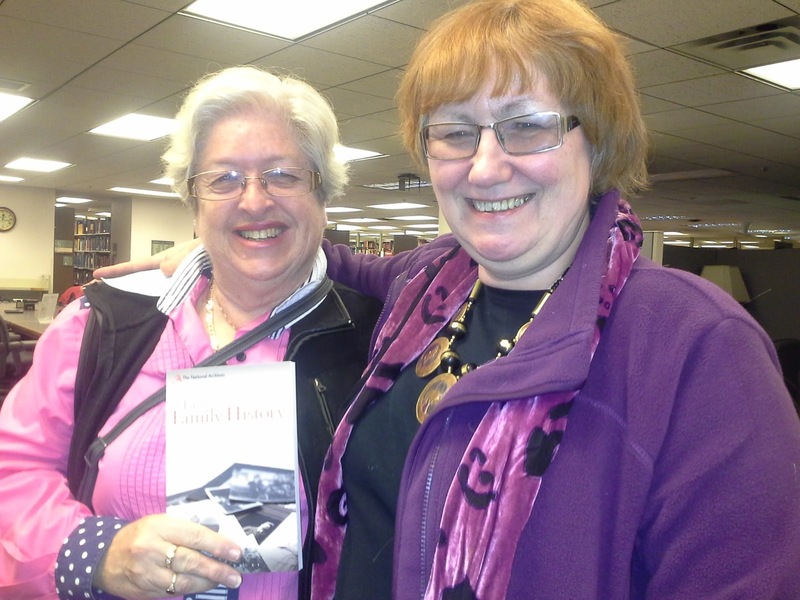 How many ordinary genealogists have the opportunity the interview such an important member of the genealogy community? So I must admit my attendance at formal Rootstech classes has been minimal but my learning curve has been phenomenal. My recorded interviews will appear on this blog in the coming weeks. I just couldn't help myself. I've never been guilty of graffiti before but I just couldn't help adding a new line to this sign in the Women's Room at Rootstech. No time for a great narrative report on today's activity so I'll post a summary of a very exciting day in which I met a bunch of interesting people. 6:00 am Leap out of bed to bathe and get ready for Rootstech. That white stuff falling out of the sky is snow - how exciting. 7:00 am After breakfast with blogger Amy Coffin I gathered my gear and headed over to the Exhibition Hall for the Bloggers tour of the booths and facilities. 8:00 am I was lucky enough to score a middle second row seat in the Hall to see the Opening Keynotes. It was nice to see the official bloggers being recognised in the promo slides. 9:00 am Dennis Brimhall, Familysearch CEO was sharing the organisation's vision for the future. 10:00 am I was being inspired by D. Joshua Taylor's presentation.Still in the Keynote session I realised that I would be late for my first video interview with Alec Tritton and Else Churchill - we got started about 15 minutes late. 11:00 am Put my head down to go over my presentation for the afternoon. 12:00 pm The wonderful Mr Geniaus brought me some lunch. 1:00 pm My fellow panelists appeared during the past hour and we discussed the gadgets we would show in our session. While she was there I grabbed Heather Rojo for a video interview. 2:00 pm A gentleman from Rootstech cornered me for a video interview. 4:00 pm A great sense of relief washed over me after our session. I sat in the Media Hub with a cool lemonade and chilled. 5:00 pm It was back to the video studio for more interviews; this time with Australians Alan Philips and Alona Tester from Unlock the Past. 6:00 pm Time to relax on my bed in the hotel and catch up with social media on my Tablet. 7:00 pm A yummy fresh dinner with Mr Geniaus at the Blue Lemon Restaurant opposite Temple Square. 8:00 pm A very special experience as Mr Geniaus and I joined a Behind the Scenes tour of the Mormon Tabernacle Choir. 9:00 pm We joined other conference attendees for a special mini-concert by the Choir in the Tabernacle. 10:00 pm Back to the hotel for an adult beverage before bed. We met up with a new and interesting couple from Dallas, Texas. Sonia Meza from Spain, another foreign Geneablogger, at work in the Bloggers area at Rootstech. It's late and I need my beauty sleep but before I hit the sack I am posting a random selection of photos from the Rootstech Official Bloggers Dinner tonight. Thanks to the people at Familysearch for hosting this function and for giving us a sneak preview of new initiatives at Familysearch. With 6,800 attendees the Rootstech Conference will not be a boutique event. I will count myself lucky if I get to meet, chat with and remember 68 of the people that are attending. I don't believe in jet lag but have been suffering from a bit of insomnia since I arrived in Salt Lake City so after midnight I decided to take a sleeping pill and it worked. I was intending to attend a lecture at the Family History Library this morning but slept in so I thought I had missed it. When I huffed and puffed into the venue for the next talk I discovered that the speaker's plane had been delayed and that the talk had been cancelled - I'm glad I had that good sleep and didn't set an alarm to arrive on time. 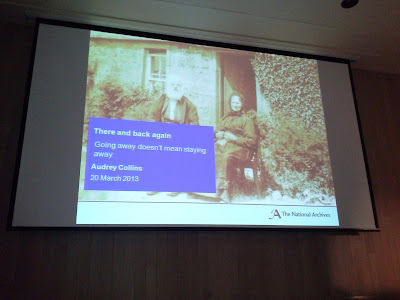 As the second speaker was also delayed my mate, Audrey Collins, stepped in and presented a talk "There and back again" in which she told us that our ordinary ancestors often travelled far and wide. She demonstrated, with a range of examples, that if we can't find our ancestors in local records we should cast our net wide and we might be rewarded with surprising results. Since Audrey's talk I have been down on B2 working away on my research while Mr Geniaus (who doesn't do genealogy or research) is looking for his ancestors on the library's collection of subscription databases. Shortly I'll be heading off to The Lion House for the Rootstech Official Bloggers Dinner where I'll renew friendships with old bloggers and meet the new bloggers. Once the Conference starts my blog posts may not be so frequent. Those who attended the Australian Genealogy Congress in Adelaide last March will remember Daniel Poffenberger from his presentations at the Conference. While I was working in the library just now I saw this tall guy with a broad smile. When he came near I said "Are you Dan?" (his name badge was twisted around and I couldn't see the name on it). Dan sat down and we had a great chat. Partway through a lightbulb went on in my head. You see I had one video interview slot at Rootstech left to fill. I asked Dan if he would consent to an interview and he agreed. YAY! So after I interview him tomorrow you will be able to hear all about Dan's work as a genealogist in The Family History Library. I'll upload the video to YouTube and post a link here on the Geniaus blog. 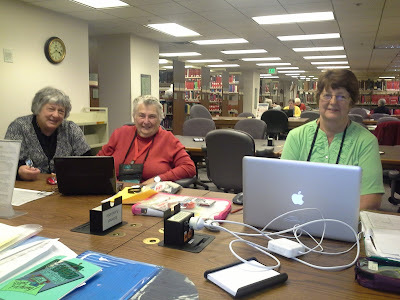 Voices from a table near me in the Family History Library on Monday sounded strangely familiar amongst the mostly American accents in the room. I wandered over and said g'day to this group of ladies who told me they are part of Jan Gow's tour group. Jan's regular genealogy tour this year is coinciding with the Rootstech Conference. On Tuesday I spotted Australian expat, Michelle Patient, a New Zealand resident who is President of the New Zealand Society of Genealogists and geneablogging pal, Roger Moffat a proud Kiwi who lives in the US. Together with the Australian contingent at Rootstech the New Zealanders make a formidable representation from downunder. Well, that could be stretching the truth a bit. Tonight my small meet the Aussies dinner turned into a meetup for representatives of the British Empire or British Commonwealth as we know the Commonwealth of Nations. Australians Jenny Joyce, Liz and Peter Pidgeon, Alan Phillips, Helen Smith, Alona Tester, Mr Geniaus and I were joined by New Zealander Roger Moffat and his wife Lisa, Scottish lass Marie Dougan and Audrey Collins who has one foot in the English camp and the other in the Scottish camp. Thanks especially to those intrepid travellers who only arrived today in Salt Lake City for making the effort to dine with us. The photos aren't as good as they could be because people kept on talking instead of posing for my pictures. I enjoyed bringing a group of my genimates together before we join the 6,000 other people who will be at the Conference from Thursday. We now at least all know about ten people among the crowd. I just caught up with my mate from The National Archives in the UK, Audrey Collins on B2 the British (and Australian) Floor of The Family History Library in Salt Lake City. Audrey knows that I am big kid who likes surprises especially if they are in the form of a book. When I visited the National Archives a couple of years ago I bought a couple of family history guides published by The Archives but I didn't buy David Annal's "Easy Family History" because it was labelled Easy but Audrey had told me it was a great little book so I thought it would be a good addition to my collection. Unfortunately the book went out of print so I didn't get a copy. My surprise today was a signed copy of the newly published second edition of Easy Family History: the stress-free guide to researching your family history by David Annal ISBN 9781408175705. The book can be purchased online from the Archives Bookshop. David says in his introduction "in the eight years since the first edition of Easy Family History was published, the world of genealogy has changed almost beyond recognition." This second edition has been rewritten to take account of the technological changes that have impacted on the way we conduct our family history research. In addition to 14 chapters that cover all common categories of resource the book has a glossary, useful addresses, useful websites, further reading and an index. From my quick scan of its pages this morning I can recommend this book as an excellent guide for beginners and a good reference for those of us who have been plugging away at our research for a while. One of the speakers on the recent Unlock the Past Genealogy Cruise suggested that we would all benefit from reading a beginner's guide on genealogy; this book would be an excellent one for this purpose. When I looked at the number of panelists on some the other Panel Sessions at Rootstech I started to worry. Some had twice as many participants as "The Genealogists Gadget Bag". I wondered if I should invite someone else but really couldn't make a decision. This has bothered me for a few weeks now. I discussed this issue with Thomas MacEntee, Mr Geniaus and Lisa Alzo last night and they helped me make a decision to invite someone else. Heather Rojo's name was among the potential people that we discussed last night. Fortuitously I met Heather Rojo and her husband Vincent in the Family History Library this morning and just knew that she would fit right in. Although I knew Heather online I did not realise what a bright and bubbly personality she had. I did not immediately ask Heather to join the panel but skirted around the issue by asking her if she enjoyed talking to people, got nervous speaking to crowds etc before I hit her with the question "Would you join my panel on Thursday at 3:00 pm? " I was delighted when Heather said "Yes". Thank you so much, Heather, for taking up this challenge at short notice; I really appreciate your involvement. With your positive attitude, experience in teaching and warm personality you are a super addition to the panel. This morning I experienced a Hangout on Air with Pat Richley-Ericson, aka DearMyrtle, did a spot of shopping (Macy's I love you) had a bite of lunch with Mr Geniaus and I am now back on B2 in the Family History Library trying to bring my blood pressure down a few notches. It's such an exciting time and there are two more sleeps until the Rootstech Conference kicks off. During the "Mondays with Myrt" Google Hangout on Air this morning Pat interviewed an interesting lineup of people who had arrived early in Salt Lake City for the APG Meeting or Rootstech Conference. Now, if you are wondering what a Hangout on Air is take a look at this Google explanation - it gives a much better description than I could. Myrt has a way with the camera; a true professional in her approach she is able to think on her feet and ask pertinent questions of the people she interviews. It was an honour and a huge learning experience to watch Myrt perform today. If you want to see a hangout and would like to meet the people Myrt interviewed I have copied the video below. Having watched the video just ponder on the possibilities this free service offers to formal societies or informal groups of genealogists who are united by a common interest. Let's get together and Hangout. 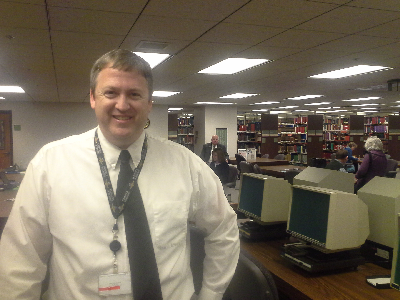 Today finds me in Salt Lake City, Utah researching in the Family History Library prior to the Rootstech Conference. The article I have chosen to share comes from a 1947 edition of the Cairns Post: 1947 'MORMONS SEARCH WORLD FOR DATA. ', Cairns Post(Qld. : 1909 - 1954), 20 December, p. 9, viewed 4 March, 2013, http://nla.gov.au/nla.news-article42556087. I want a portable collapsible screen just like DearMyrtles that she is using for the Mondays with Myrt Hangout on Air. Hint , hint Mr Geniaus. Ten and a half hours sleep in a comfortable bed at The Radisson have done winders for this tired old girl. I am now revitalised and ready for a hectic week at Rootstech. My genealogy day started in the elevator when I met two delightful ladies from Wyoming, Melanie and Gloria who invited me to share breakfast with them. It was evident from the snippets of other conversations I overheard that the breakfast room was populated with genies. After a journey lasting around 20 hours from door to door Mr Geniaus and I arrived in our hotel in Salt Lake Cit this afternoon. We have already met up with US geneablogging mates Lisa Alzo, Thomas MacEntee and DearMyrtle. With fellow Australian, Jenny Joyce we toasted St Patrick with Lisa and Thomas. As we are sadly lacking in the sleep department we are calling it a night. I'll be up bright and early tomorrow refreshed and ready to blog about the activities during Rootstech week. I'm loving the conversation on the Memories of Blacktown Facebook Page. Although I have no links to Blacktown they topics discussed there bring back many memories of life in the 50s and 60s in suburban Sydney. Packing the essentials for Rootstech! 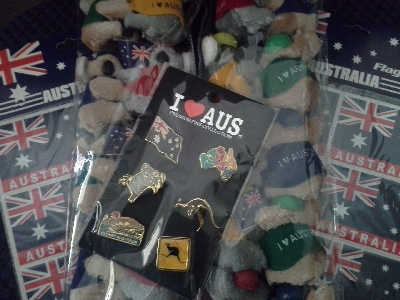 I've only 40 koalas to share with my genimates at Rootstech. 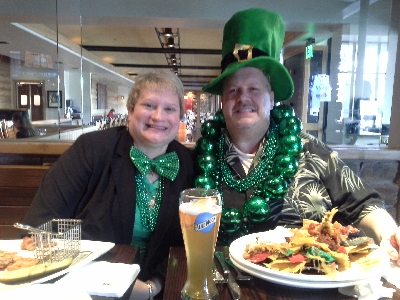 Mr Geniaus and I are meeting up with @infolass Liz Pidgeon) and Mr Infolass for Dinner at The Gateway Center in Salt Lake City at The California Pizza Kitchen on Tuesday March 19th prior to Rootstech. We'll be there from 6:30pm (we old-timers eat early). 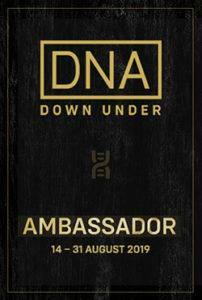 I am hoping that some other Aussies, our neighbours from New Zealand and other curious genies who would like to meet up with people from the deep, deep south will drop in and say G'day. If you would like to join us please drop me an email jillballau@gmail.com (or message me via the Rootstech App) and we will make more concrete arrangements to meet up or feel free to just swing by. Just before Christmas I received an email from the Rootstech organizers that said "Congratulations! Your RootsTech presentation “The Genealogist’s Gadget Bag “ has been identified as a session that we would like to stream live online on the RootsTech web site for those who are not able to physically attend the conference." Of course I agreed, I was honoured and delighted. What a this was coup for Australia to have an ordinary citizen in this lineup! I informed my co-presenters,Marie and AC, completed the Familysearch "Release to Record" form, and asked my co-presenters to do the same. As the Rootstech people asked us to keep this secret we did. As the weeks went by and there was no more mention of livestreaming from the organizers I thought that our session had probably not made the cut. After all there is a huge group of very competent and inspiring speakers on the Rootstech program. Why would they select for livestreaming a little granny from downunder with a strange turn of phrase and an even stranger accent? Then a couple of weeks ago Randy Seaver wrote in a blog post "While the live-streamed sessions have not been positively identified, I'm going to go out on a limb and guess that they will all be shown from Hall 1 (because that is where the Keynotes will be, and the live-streamed sessions were shown from Hall 1 the past two years)." This put the cat amongst the pigeons as I knew that my session was to be in Hall 1 and if Randy was right in his predictions I was about to be thrown on the world's geneastage. I have been nervously awaiting an announcement from Rootstech to see if I had really made the cut. Sometime after 11:00 pm (Australian time) last night the sessions to be livestreamed were announced on the Familysearch blog. I had a quick look at Facebook before I went to bed and there was a message from Spanish blogger, Sonia Meza, telling me that my session was to be livestreamed. When I woke this morning I found the Familysearch post and confirmed that my session will be livestreamed at 3:00pm (US Mountain Standard Time). As I read this post I felt my palms getting sweaty and a swarm of butterflies breeding in my stomach. The list of people to be livestreamed is rather impressive; those who are not able to make the real Rootstech Conference will be able to have a wonderful learning experience wherever they are. I have trouble with timezones but I think that this will mean I will be on air on Friday 22 March at 8:00 am Sydney time. I used the Time and Date converter at http://www.timeanddate.com to confirm this. You may wish to check it for your location. How will you access the livestream? The Familysearch blog post says "NOTE: A WEBCAST WINDOW WILL BE AVAILABLE ON THE WEBSITE LISTED TO WATCH THE LIVE STREAM STARTING THURSDAY, THE OPENING DAY OF THE ROOTSTECH CONFERENCE." When I have more details I will share them on this blog. So there you have it. I will be presenting to the world from Salt Lake City in one week's time. Now I had better turn my attention to packing my bag and organising my travel documents. As I sit here feeling proud, honoured, nervous and stunned I am left wondering. This small poster shared on Facebook by Sonia Meza Morales gives details of the feast of learning I will enjoy next Wednesday in Salt Lake City prior to Rootstech. 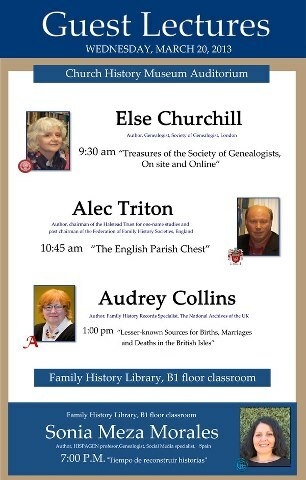 The correct details for these talks does not yet appear on the Family History Library Site. at 1:00 pm to listen to Audrey Collins. This is an amazing opportunity to hear from a group of British experts. I was thrilled to hear from Liz Pidgeon aka Infolass, who is presently in New York on her international study tour of local and family history institutions and repositories. I have been following Liz's blog and enjoying the virtual visits she enables her readers to have to an amazing collection of sites. 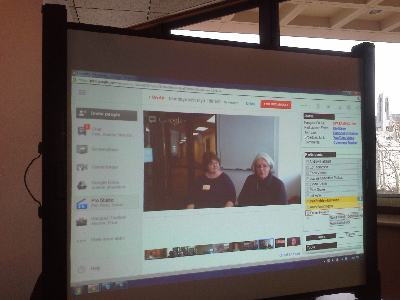 The Rootstech Conference is on Liz's itinerary so I approached her for a video interview while there. Once done I will post the interview on Youtube and (if technology allows me) to this blog. If you have any questions regarding Liz's amazing journey please let me know and I will put them to her during the interview. I was excited to see on the Rootstech App that Calico Pie the company behind my genealogy software package, Family Historian, will be at Rootstech. As a relatively new convert to Family Historian an opportunity to talk to representatives from Calico Pie is most attractive. I was wondering if it would be a North American representative on the stand or if someone from the UK would be making the trip to Salt Lake City. For an Australian to have an opportunity to speak in person with a software developer is fantastic. This snippet from the Family Historian Bulletin that just hit my inbox has me jumping for joy. The 3rd annual RootsTech conference is happening in Salt Lake City, Utah, U.S.A., in March (21st to 23rd). We will be exhibiting there (booth 527). Simon Orde, chief program designer, will be on hand to answer questions and will give a presentation at 3pm on Friday 22nd March, in the Demo Theater . I will definitely be in the queue at Booth 527 with my list of silly questions for Simon. One of the perks of being an Official Blogger at Rootstech is being able to conduct Video Interviews in a studio with real technicians and professional equipment. I was just too shy to try this at Rootstech 2011 but, in 2012, I dipped my toes in the water and conducted two interviews. I only managed two because bookings for the facility are very popular and fill quickly. Now that I am in my third year as an Official Blogger I know the ropes so, this morning, as soon I got notification that the bookings were open I grabbed Six (that's right 6) 30 minute slots. My issue is that I have to decide on whom from the 4,000 or so attendees at the conference I will approach for an interview. Should it be Aussies? Brits? Commercial Dudes? Should I do a couple of mini panels? Geneabloggers? Familysearch Reps? Early last week I put out a question on Twitter "Need help please. 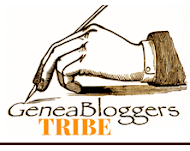 What three things make a geneablog great?#genealogy" and on Google+ "I need your help so that something I am working on is just not my opinion.. What three (or more) features make a geneablog great?" This post is my thankyou to those generous genies from Australia, Britain, Europe, New Zealand and the US who took the time to message their thoughts to me. Thanks to you I have developed a rough rubric to assist me with the task I am completing for Inside History Magazine ('m not saying any more on that for the minute). The title of this post comes from what I think was the most original response; Caroline Pointer suggested that great geneablogs are "Ones that take me on a glorious and unforgettable ride. And all the other stuff everyone else suggested." As I received the suggestions I popped them in a Google Doc. I am pasting those suggestions here so that you can see what others think. Do you agree? Do you have anything else to add? Where will I be found on the days prior to the Official start of the Rootstech? I'll be looking for ancestors in the Family History Library but won't be doing this all day as I'll take time out from the microfiche to hear some international geneastars give some lectures. I've heard that the Best of British: Audrey Collins, Else Churchill and Alec Tritton may be in the lineup. I just noticed that there is now an email to register for classes on the page that lists the classes so if you wish to make sure you have a seat for the classes you'd like to attend it might be a good idea to shoot an email off to the people at the library. STOP PRESS: Although the website has a link to register for classes I have just had an email that this is not necessary. All one needs to do is rock up on the day. Yesterday I took my mother to visit the opthalmologist. How things have changed since my first visit to the eye doctor nearly 60 years ago. Just for fun I put the search term "Opthalmologist" into a search in Trove to see what I could find and what caught my eye was this from the set of results on the right hand bottom of the page. What jumped out at me was the name Gregg, Sir Norman McAlister. It took me back 50 years to a dark set of consulting rooms in Macquarie Street, Sydney furnished with old brown leather chairs and sombre timber furniture. Sir Norman was a pleasant elderly gentleman whom I visited on a number of occasions for my regular eye checkups. I knew that he was important because he was a Sir but I had forgotten all about him and his amazing scientific discovery until I saw his name on Trove. Following the link from this page took me, not to an archived Pandora website as I expected but, to a page on the Australian Dictionary of Biography that contained biographical information on Sir Norman. Having read that article I realise why I didn't see Sir Norman after I left school as he had passed away in 1966. The article on the ADB said that "Gregg talked easily to his patients, and kept a tin of sweet biscuits for the children". He did have a good rapport with my Mum and me but I can't remember ever being offered a biscuit. Sir Norman's great discovery was "that rubella in early pregnancy caused cataracts and other birth defects". Having read the article I found via Trove I realise how fortunate I was to be under the care of such a distinguished Australian. News of this family reunion in the Hawkesbury came through on two Rootsweb mailing lists to which I am subscribed yesterday so I guess the organisers are trying to get the word out. "All descendants of John GRONO & Elizabeth BRISTOW are invited to attend a family reunion to commemorate the 214th anniversary of their arrival in Australia on the "HMS Buffalo" in 1799. Related family surnames are BOOKS, HALL, HARTLEY, McKENZIE, MITCHELL, MOBBS, and SMALLWOOD." So far I haven't been overwhelmed by responses to my latest Geneaeme but the responses received have been pure gold. Thank you to those who have responded to the meme - so far it looks as though blogging tools are the Favourite social media tool of respondents. I will continue to add to this list as if responses trickle in. I'm sending a big thankyou to my blogging mate from California, Randy Seaver, who selected my geneameme for his Saturday Night Genealogy Fun activity this week. I had wondered why I had received contributions from bloggers who were previously unknown to me and then realised it was because of Randy's promotion of the activity. PS - the number of posts is looking much healthier now (5/3/2013). Behold Genealogy Blog - Louis Kessler - in which Louis recounts his responses to the cruise panel activity that started this meme thing off. BooBook from the Backtracking Blog commented on Jackie's post "I'm with you Jackie. You've said it all. The only one I would add is Flickr for online photos - I've been scanning some of the old photos and putting them online for people to see and comment on. (Is that counted as social media?)" Rootstech is becoming an international event. 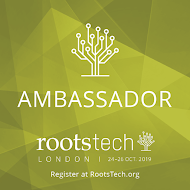 Not only will the Australians be out in force at Rootstech I have also noticed that several genealogists from the UK will be in attendance. Apart from my mates Audrey Collins and Marie Dougan who I look forward to seeing again I see that Rosemary Morgan is joining the ranks of The Official Bloggers so I will have company from the Commonwealth in the Media Hub. I see also that Else Churchill, genealogist from The Society of Genealogists, is making the trip across the pond as is Alec Tritton, Chairman of the Halstead Trust. Diana Bouglas is another member of the British contingent. From the Land of the Long White Cloud I see that Michelle Patient, President of the New Zealand Society of Genealogists, and Jan Gow of Hooked on Genealogy Tours will be in attendance. I can't wait to meet up with more people whose names I have heard but whom I have not yet met face to face.